Home / about / how should I display my art? Many works from the Buddha and Enso series are pre-hung with a wooden rod to display scroll-style on a wall with grace and dignity. 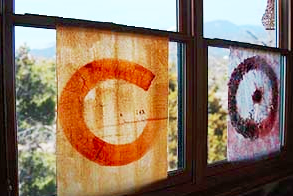 The translucent nature of some banners creates a striking effect when displayed in a window (but be aware, pigments may fade faster). Collages and individual works on paper are best displayed in a natural wood frame or shallow shadow box. Fiber works such as potholders are meant to be utilitarian and to bring a splash of color into your daily life! Prints of original artworks are available for purchase here.